Discover inviting, spacious accommodations and experience the best of Humboldt County, when you book your West Coast getaway at the Days Inn & Suites Arcata. Ideally-located amid the area's most compelling attractions, we're only minutes from Humboldt State University, Arcata/Eureka Airport and Old Town Eureka. We're also just down the road from pristine beaches, top casinos and Redwood National Park, where you can get up close to Northern California's breathtaking giants. Nestled within a natural paradise, our Arcata lodging facility provides a wealth of comforts and conveniences, including a sparkling heated pool, a rejuvenating hot tub and relaxing, pet-friendly rooms. We also provide a number of complimentary services, including a delicious continental breakfast, free Wi-Fi and friendly guest service from an attentive, professional staff. 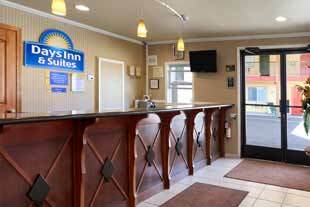 Center your Pacific Coast vacation at the Days Inn & Suites Arcata and discover the best value under the sun.